I remember myself being very angry as a kid (surprisingly, this was before my teen years). Life just did not work the way I wanted it to work – people did not behave the way I expected them and my actions did not get me where I wanted to be. Life pretty much sucked (I hope it is OK to say “sucked” in a post, because it explains how I felt perfectly). It took me a while to understand what this quote meant, but when I did, a huge, heavy load came off my young shoulders. Realizing that anger was a poison I was carrying with me was a big revelation – scary, but very relieving. My life has been much happier since. On my life coaching journey, I meet many angry people. Angry, disappointed and frustrated that most of the time, those feeling are reflect by their relationships, their health and their level of success in life. One major rule in teaching happiness is that the space inside is limited to one of them only and you have the power to choose. There is a beautiful story I love to tell that explains in a wonderful way the power of that choice. It is the story of the two wolves. I hope you find inspiration in this story the way I do. One evening, an old Cherokee told his grandson about a battle that goes on inside people. He said, “Grandson, the battle is between two wolves inside us all. One is Evil. It is anger, envy, jealousy, sorrow, regret, greed, arrogance, self-pity, guilt, resentment, inferiority, lies, false pride, superiority, and ego. The other is good. It is joy, peace, love, hope, serenity, humility, kindness, benevolence, empathy, generosity, truth, compassion and faith”. The old Cherokee replied, “The one you feed”. 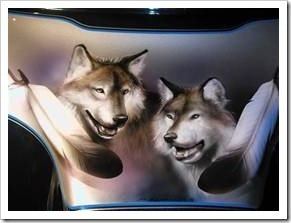 The two wolves are there when you look for a path in life. The two wolves are there when you fight your kids’ behavior. The two wolves are there when you need to make a choice. The wolves are there when you relate and communicate with others. The two wolves are there when you consider trying something new. The two wolves are there when you come home in the evening. The two wolves are there when you look at yourself in the mirror. Which one will you feed today? I love this story of wolves. It is giving me an in-depth reflection of my own feelings towards others. i admit i have some personal issues with a very close friend of mine and this is due to some resentment and i think ego that is built up between the two of us. i think what happen was we are both feeding but the wrong wolf. thank you for this. ill work on feeding the right wolf after this. for many years I worked on the “Success Experience” theory that had the version of the wolves in a format of a scale and when I heard this story I said, this is perfect, this explains so wonderfully how much we are responsible to our feelings and thoughts. We are just humans and it is part of life to have feelings of sadness and resentment, frustration and anger however, when we realize we feed the bad bad wolf we understand that we carry those feelings with us, which is worst. I tell all my clients that we must first take care of ourselves. 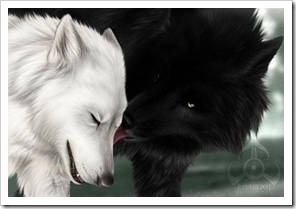 if the bad wolf is in-charge, if it is big (from too much food we gave it) it is hard to love, hard to care and share. Be we all have a good wolf inside and it needs us to feed it with happy thoughts and ideas. Whenever you think of your friend and have resentment move the thought to a good memory of a good time with that friend – that would feed the good wolf and help you starve your bad bad wolf.